A Xian MA60 passenger plane, PK-MZO, sustained substantial damage in a hard landing accident at Kupang-Eltari Airport, Indonesia. There were 46 passengers and 4 crew members on board. Four passengers and one crew member sustained serious injuries. During the approach, the power lever lock was selected to open position in accordance with the operator's normal checklist. and remained in that position. The autopilot was disconnected while descending trough 1100 feet. At that point the airplane was just above the 2.9° approach angle. - The procedure of selecting Power Lever Lock to "OPEN" during approach was made without comprehensive risk assessment. - Both power levers entered BETA MODE at 90 feet due to the safety device namely Power Lever Lock has been opened during approach, which was in accordance to the operator procedure and lifting of Mechanical Power Lever Stop Slot which was not realized by the pilots. - The movement of power levers to BETA MODE resulted the pitch angle changed to low pitch angle which produced significant drag and made the aircraft loss of significant lift. The FCOM contain information that contrary to the other aircraft manual and to the actual condition in the aircraft and was written in un-common aviation terminology. The NTSC has issued recommendation to revise the FCOM with common aviation terminology following the accident of MA 60 which occurred in May 2011. 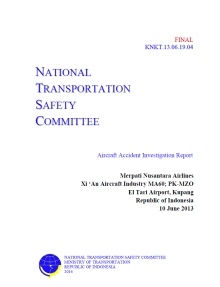 On 17 December 2013, the NTSC received a comment letter from the CAAC which could be classified as safety actions. However the NTSC is waiting for the information of the follow up of those safety actions. To review the DGCA quality system in controlling the operator in conduct any changes of the safety related procedures to assure the authority acknowledgement and approval. To review Master Minimum Equipment List (MMEL) of MA 60 to comply with the Indonesia CASR. Refer to previous accident of MA60, The NTSC re-issue recommendation to emphasis the DFDR parameters shall meet with the CASR requirements. Distance from Bajawa Airport to Kupang-El Tari Airport as the crow flies is 328 km (205 miles).